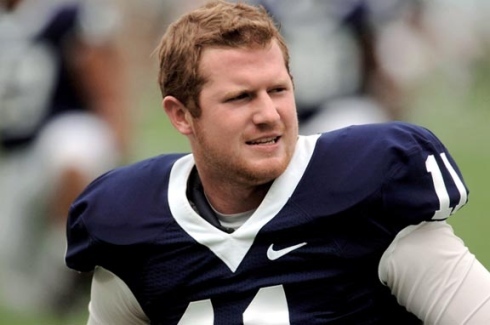 Tonight is a special night for my hometown of Scranton, PA. Tonight, our local hero, Matt McGloin will suit up for the Oakland Raiders against the Dallas Cowboys for his first NFL game. Had you told someone five short years ago that Matt would be playing in the NFL almost no one would believe you. Matt played for West Scranton High School, and by all means was successful. He was named to the all-state team in football and was a varsity starter in three sports. He scored 1,300 points for the basketball team, and was a .400 hitter and lights out pitcher for the baseball team. The kid is an athlete. However, he did not receive many major offers as a football recruit, choosing instead to accept the challenge of trying to walk on at Penn State. This was a smart decision. Matt joined the team in 2009. I was lucky enough to get to see him play in limited time against Syracuse. Our family friends, the Gentilezzas are gigantic Penn State fans and supporters. They had come in contact with Matt’s family and offered their full support and friendship to the McGloin family. This too, was a good decision. 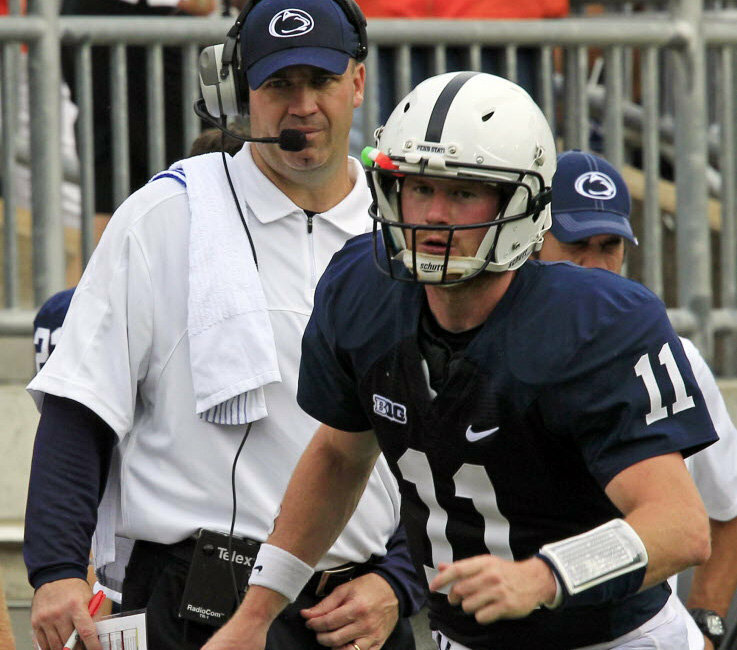 In 2010, Matt switched off with Rob Bolden as the starting quarterback for the Nittany Lions. Against Minnesota, Bolden suffered a concussion, leading to Matt taking over the quarterback duties for the team. As with everything in Matt’s career, he made the most of the opportunity presented to him. 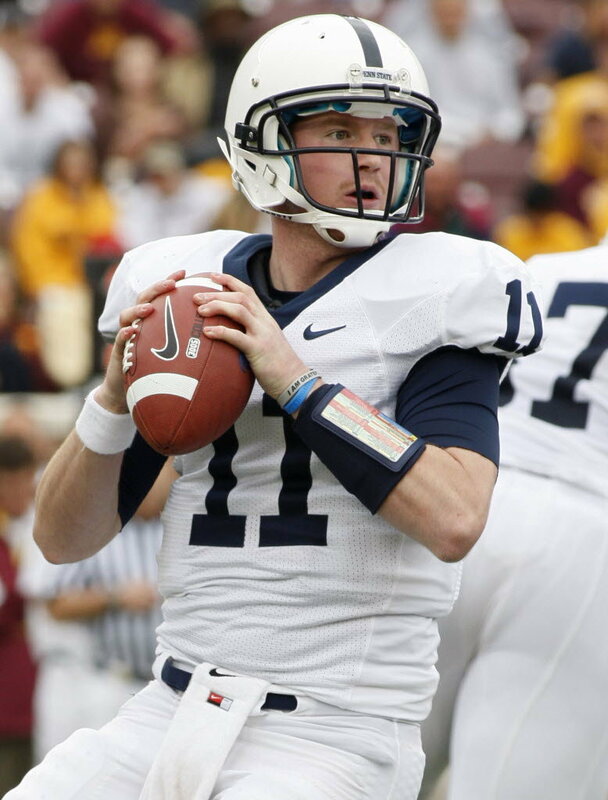 Matt threw the first two touchdowns of his career to Derek Moye, leading Penn State to victory. He was named the starter for the next game: Michigan. Now, for those who do not follow Penn State religiously, Michigan is one of our (I’m speaking on behalf of Penn State fans) biggest rivals, only slightly behind Ohio State as our biggest. We had not beaten Michigan in years, so this game would be an even bigger win if Matt could pull it off. 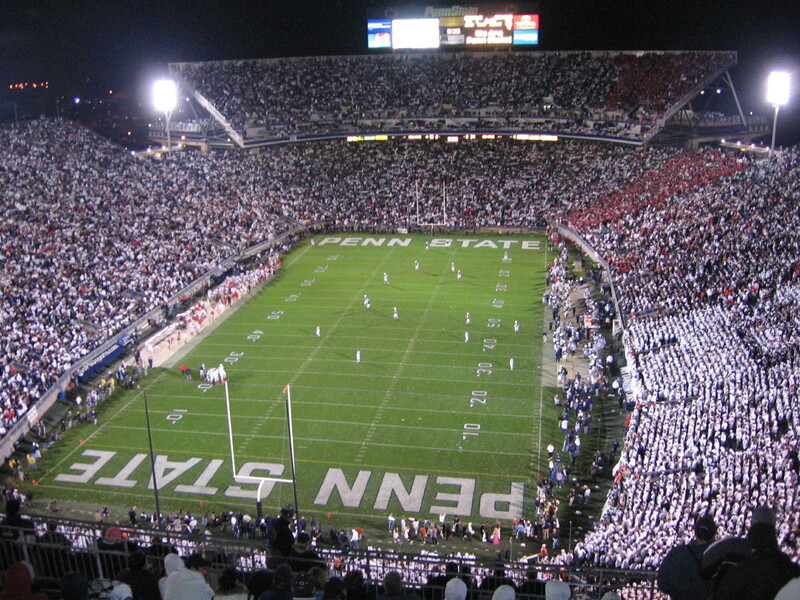 I was lucky enough to go to this game and went in carrying my 5-0-career record when attending Penn State games. I’m not saying that their success was because of me, but their success was because of me. So what happens in the game? Matt throws for 250 yards with two touchdowns, one passing and one rushing, while leading the team to a 41-31 victory. Before the game, ESPN analyst Kirk Herbstreit had made negative comments about Matt’s potential. 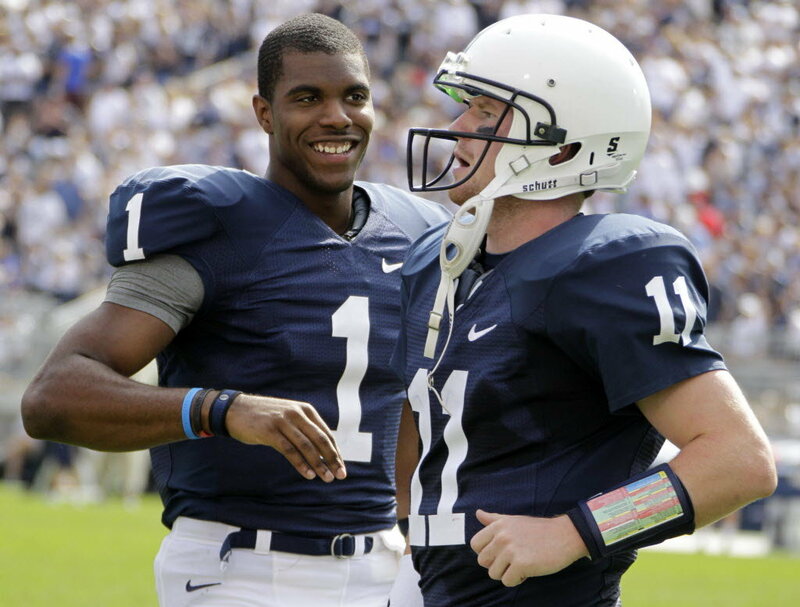 There were three things that made me a huge fan of Matt’s while he was at Penn State. The first being that he was an awesome quarterback. Seriously, the guy was incredibly productive in almost every game he played in. Second was the fact he hailed from Scranton. How can you not root for the hometown kid? Third, and quite possibly the most important reason was his family. Thanks to the Gentilezzas, I was able to get to know the McGloin family relatively well while attending games. I can safely report that they are wonderful people and could not have been any more sweet and inclusive of me. The parents, Paul Sr. and Cathy are incredible people, as are his brothers John and Paul Jr. One of the sweetest moments I’ve had the privilege of being a part of was when Matt came off of the bus to walk into the stadium as the starter for the first time against Michigan, I was standing with his parents. Paul Sr. gave me a gigantic bear hug with tears in his eyes, proud of how far his son had come. Hell, I was proud too, and I’m years younger than him. Matt went on to replace Bolden as the quarterback against Northwestern, leading a 21-point comeback that doubled as Joe Paterno’s 400th career victory. He had made a definitive imprint on the team, and stayed the starter for the remainder of the season. As with many college teams, in the spring before their season there is an exhibition game. For Penn State, this is the Blue-White game. This game was the catalyst for one of the funnier Penn State stories I’ve been a part of. After the game, my family and I had come back to our hotel, only to find out that the McGloin family was also staying there. I decided to come in and say hi. I brought my friend Matt Bruzzano along as a birthday gift to him. I left him of what I thought would just be a minute. When I came into the dining room at the Penn Stater hotel, I was greeted by the family, Matt, and former Penn State cornerback D’Anton Lynn, and brought a chair so I could sit and join the group while they ate. I was confused and excited. I chit chatted with everyone there. Matt about what he thought about the upcoming season, D’Anton about his prospects in the upcoming NFL draft, John McGloin about fantasy baseball. It was wonderful. Then one of the weirder coincidences I can remember happened. 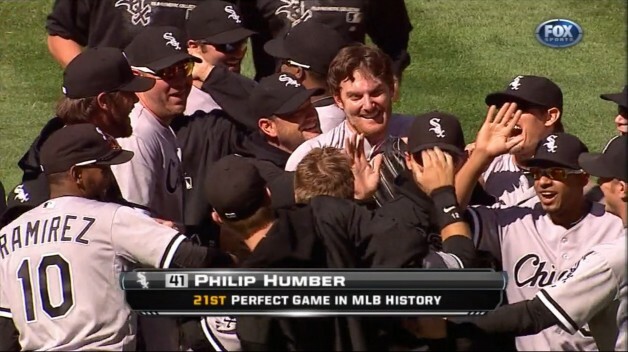 Phillip Humber was heading into the ninth inning of his perfect game against the Seattle Mariners when I was alerted via text of the fact by ESPN. I ended up watching the ninth on my cell phone with the McGloins. This was awesome. In the 2011 season, Matt split time again with Bolden. The team had a lot of trouble this season, both on and off the field. Late in the year, the now infamous Penn State scandal came to light. This devastated the close-knit football community of the college. It devastated me. The team just needed to have the season over. Yet, as I say that, the team ended the year 9-4. It just seemed hopeless (save for defeating Ohio State) for the rest of the year. Post-scandal, the team went 1-3. After scores of players transferred out of the school before the 2012 season, gutting the team of their depth and some stars, Matt became a definitive leader in the locker room. He was the definitive starter for the full season under new coach Bill O’Brien. The two got along incredibly well. At least by my eye, it appeared as though Matt thrived in the new offensive scheme, which was an almost exact replica of the one the New England Patriots had used to much success under O’Brien’s tenure with the team. Matt ended up having an incredibly successful season statistically speaking. He completed 60.5% of his passes for 3,271 yards and a 24-5 touchdown-to-interception ratio. He scrambled for five more scores as well, and became the Penn State career leader in touchdown passes. He led the team to an 8-4 record, yet that record doesn’t fully explain how special this season was. The team dropped its first two games to Ohio and Virginia. This was in large part due to the mass transfers and a brad new coach for the first time in years. This was a team looking for an identity. Once found, the team reeled off an 8-2 record only losing to Ohio State (which finished the season undefeated, only missing the championship game due to NCAA sanctions) and Nebraska (who was probably a better team all things considered). 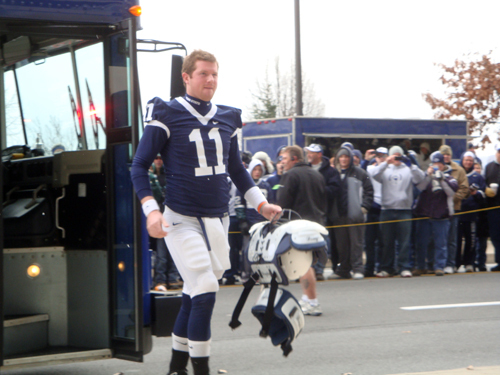 Matt finished his career as one of the more memorable quarterbacks in Penn State history, partly due to his play, but largely due to his story. Let’s recap: He comes out of a relatively small high school and decides to walk on to a big time program. Once there, he fights for his chance to prove himself. He eventually becomes the starter, leading the team to wins against big teams like Michigan and Ohio State. He ended up as the all time leader in touchdown passes despite splitting time for two of his three seasons under center with someone who was nowhere near the same caliber of quarterback, but was more traditionally athletic in the eyes of the coaching staff. Then we get to this year. Matt went undrafted in the NFL Draft, yet kept up his fight. He tried out for the Panthers and Redskins without success. Then he signed on with the Raiders. 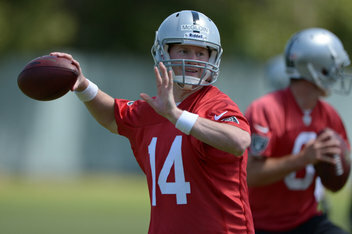 Matt would be the fourth string quarterback behind Matt Flynn, Terrelle Pryor and Tyler Wilson. Matt, true to form, fought hard and eventually leapfrogged Wilson, a fourth round draft pick, for the third string spot. Coach Dennis Allen was raving about Matt’s play with incredibly limited time in practice. Matt will be making his NFL debut tonight, silencing every single critic he has faced yet again. Even if I weren’t blessed with getting to know him and his family, with him taking snaps for my favorite college team, and with him growing up in my hometown, I would still consider him a role model. Yet all of that is the case, and it makes for Matt being one of the biggest role models in my life. I will soon be out of my leg cast and have to face another long period of rehabilitation. It’s very easy to be upset about a set back, trust me on this. But I try to keep positive. I know I’m going to come out of this stronger than ever. I’ve done it after nine previous fractures; I will do it after the tenth. When I sit around and think about whether or not I can do something, I remember that a similarly red haired kid pulled off the impossible time and time again and is living, breathing, tangible proof that hard work pays off, and anything can be overcome. I should have my cast off next week. Tonight starts the next step of Matt’s career. I’m dedicating my next step, my first since June, to him, for reminding me that I can and will beat this. Connor Lenahan (@ConnorLenahan) is the founder and editor-in-chief of Connorlenahan.com. He is a freshman at Boston University, majoring in journalism. Wow. You nailed it Connor. The only negative personally for me is that it’s hard to read with tears streaming down my face HaHa. It was a glorious 5 years and I am proud and honored you were there with us all the way. Last year will forever be my favorite Penn State team one that will continue to prove to people how special these young men were and will continue to be. Wait until John Urschel and Eric Shrive eventually leave to prove that last year wasn’t a fluke as they go on to do great things in their lives.